MoveHub are back with another one of our famous map-o-graphics! 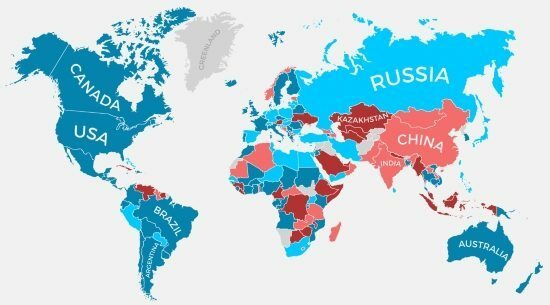 We’ve compared happiness across countries and now compare which countries allow and restrict dual citizenship around the world, which is important to know when moving abroad. Certain countries, such as the UK and Australia allow dual citizenship under all or most situations. Others, such as Russia, Spain, and Turkey allow dual citizenship, but residents either have to notify the government before and after applying for a second citizenship, can’t run for federal office, or only allow citizenship from certain other countries. Countries that restrict dual citizenship tend to have strict rules that only their citizens can have dual citizenship, but not naturalised foreigners, or only if another country won’t let someone out of their original citizenship – which is Norway’s loophole. Then there are those countries that have a no tolerance policy, such as Austria and Ukraine. Many countries in the last year are rethinking their policies on dual citizenship, which would greatly help those immigrants moving abroad and naturalised citizens. There are benefits for have two or more passports that extend beyond the UK/EU line at borders; travelling and working in more than one country is the way forward. What happens if you move abroad and that country won’t allow you to retain dual citizenship? Well, some countries will let you ‘renounce’ your citizenship but leave the door open if you choose to return (like Ireland). Others unfortunately will make you pay a fee to give back your passport. Some countries, such as South Africa and Sweden have eliminated fees, whereas others such as Poland, Egypt, and Jamaica make you save up a bit before applying. The biggest offender, however, is the USA, which has a record breaking $2,350 fee and a ‘name and shame’ law from 1996 for its citizens to endure. Almost 4,300 Americans paid the hefty price in 2015. Sorry, Americans! Unsurprisingly, many countries do not outright publish the standard fees for renouncing citizenship/application to do so. MoveHub attempted to get this information from several consulates that did not display the fees on their or other government websites and will update the list when we receive responses. Other countries, please, do not follow the ways of the USA and make your citizens pay more money. Do you think more countries should allow dual citizenship and keep up with global forward trends? Share your thoughts with us below!